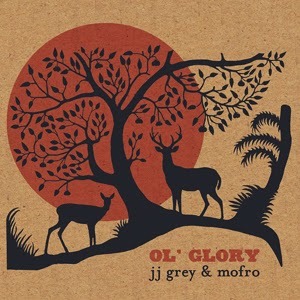 RockUnitedReviews: JJ GREY & MOFRO: "Ol' Glory"
Celebrated soulful JJ Grey & Mofro released their new album called Ol' Glory as a debut album for Mascot Records/Provogue. This amazing CD contains twelve new songs all being a blend of blues, rock, blues rock, folk, gospel and funk. The songmaterial on Ol' Glory reflects two themes namely: finding happiness with where you are in your life and a strong sense of place. All the tracks feel like a breeze of fresh air although the influences of JJ Grey''s all time musical heroes, Otis Redding and Jerry Reed, are clearly present. The opening track Everything Is A Song starts with a rather "commercial" feeling but JJ's amazing passionate vocals turn this song into an instant classic Mofro track. Follow up The Island is rather melancholic, but it is a song that I liked right from the start and it gets better and better every time I listen to it. The title track comes straight from the Stax best period while Every Minute features an amzazing horn passage and ends with a great slide guitar solo. Closing song The Hurricane is a mix of country and soul, but my absolute favourites are: Brave Lil' Fighter and A Night To Remember. JJ has done it again, he made an album straight from the heart, very emotional and moving. An almost perfect mix of soulful R' n B, blues, southern rock, gospel, funk and folk. Check this album out as it is probably one of the best and honest releases of this year. Play it loud and often and let JJ amaze and astonish you.